Today we got to visit the engine room! This had been promised for a while, and for the last 2 days its been rumoured it was about to happen. Yesterday one of the crew handed out earplugs at breakfast, with no explanation, and we all assumed it was because they were drilling on deck, but now it seems it was for the engine room trip. Of course, when the announcement came that passengers should meet at the elevator, they didn’t mention the earplugs… or the helmets that they sent us back to get…. But eventually we were kitted out and we descended to the lowest accessible deck (deck 3 – the two below contain water and fuel and are below the water level). We entered through a non-descript door, into an incredibly hot (avg 43 degrees) and very noisy room, with metal walkways around the edge and the enormous 8-cylinder engine down below. After gawping at the engine, we were taken to the engine control room where the chief engineer gave us some information about the engine. To be honest between his heavily accented English, translating for the French and making sure neither Lauren no myself accidentally leaned back and pushed a critical button, I didn’t retain much. The red square is ‘some kind of failure’ according to the chief engineer. Ok, then. It was definitely cool to see, though I can’t imagine working in that environment every day – hot, airless, only artificial light. I’d need more than a pile of kit kats! This evening we had the most incredible sunset I’ve ever seen. And I’ve seen some pretty special ones. I promise I haven’t touched up the photo in any way. We wandered out on deck after dinner, as is our habit, to get 15 minutes of air before returning to our cabin. To be honest there had been low hanging clouds all day and I had assumed we’d missed the sunset. We walked round the back of the deck and were literally stunned. We both said ‘oh wow’ then I sent Lauren to run and get the other passengers, as I knew they wouldn’t want miss it. The photos don’t do it justice, but still, they give you an idea of the incredible mix of colours from a patch of bright blue to purples, pinks and orange. The sea was glowing pink. Today we finally held the ‘crossing the equator’ ceremony that we had presumed would happen on the day we crossed the equator. I think they just like to keep us guessing. Mid afternoon all passengers were summoned up on deck over the ships tannoy, by the captain. Having some inkling of what might be about to happen, we dressed in clothes we didn’t mind getting dirty/wet. As we arrived, the Captain (in shorts and t-shirt) grabbed Lauren’s hand and said he had a job for her, she needed to wake up Neptune, God of the Sea, who just happened to be having a nap in the cupboard off the bridge…. She went over with him and ‘woke up’ Neptune and his helper (?! ), who turned out to be two of the mid ranking officers with mops on their heads and dressed in sheets. ‘Neptune’ also had a crown made of silver foil, a beard made of cotton wool that kept shedding bits and a ‘sceptre’ that looked suspiciously like a broom covered in silver foil. Lauren was then told to sit in a chair, and ‘Neptune’ muttered something or other over her, pronounced her new name to be Betta Splendens, and bonked her on the head with his staff and the chief mate poured water over her head. She squealed a bit (it was cold!) but took it in good part. After the passengers, who got off rather lightly on the soaking front, it was the turn of the two ‘baby sailors’ or cadets. They are just 19 and 20, and this was their first crossing. They are funny boys, clearly not the best students (they keep telling Lauren to study hard so as not to “be like us”), and desperate to get onto cruise ships where they can ‘meet girls’. They seemed genuinely not to know what to expect, perhaps thinking they’d get the same treatment as the passengers. No such luck. After the initial ceremony, the first one went to get up and the captain said ‘oh no, we’re not done with you yet’ (or equivalent, in Italian). At that moment, the chief mate, who had mysteriously disappeared, loomed over from the top where the flags are, and poured a huge bucket full of very dirty water (I think it had coffee grounds and other kitchen waste in) over him. As if that wasn’t enough, the captain then produced some hair clippers, and shaved both sides of his head, leaving a silly little mini-mohican in the middle. The chief engineer then stepped up with a tub of grease, and proceeded to ‘paint’ his arms with it! The same procedure was followed with baby sailor number 2, although this time the captain completely shaved only one side of his head. After the ceremony, the cadets were hosed down with sea water – not that this achieved much in terms of cleaning them up – and Lauren of course jumped in with them, along with one of the French guys. After this, the cadets were sent off to scrub themselves down and the rest of us changed into dry clothes for the traditional BBQ dinner. The piri piri went down very well on the grilled chicken off the BBQ – was almost like being back in Mozambique! Day 23 – Lauren’s Birthday!!! Today was a really special day. Lauren’s 9th birthday, and the day we crossed the equator! I was really touched how everyone – from the captain to the crew to all the other passengers – conspired to make today special for Lauren. Every single person she came across during the day wished her happy birthday. It was certainly one of the more memorable ones, and the first one since she was two that I didn’t have an incredibly complex cake to put together. Last night I was give special permission from the chef to use his kitchen after Lauren had gone to bed to prepare her traditional birthday breakfast of pancakes. Given that passengers aren’t normally allowed to even step foot in there, this was a big deal. Working in that insanely hot environment gave me even more respect for our chef Matteo, who has worked on the ships since he was 19 and must now be in his 50s. And I have to say, the kitchen is a model of cleanliness and professionalism, everything sparkling and in its place – I guess having everyone go down with a bug would be a nightmare on a ship. Once I’d finished the pancakes and cleaned up after myself, I decorated our table in the dining room which sparkly confetti, and the lounge with over-sized multicoloured balloons with ‘I am 9’ on them, before falling into bed just after midnight. 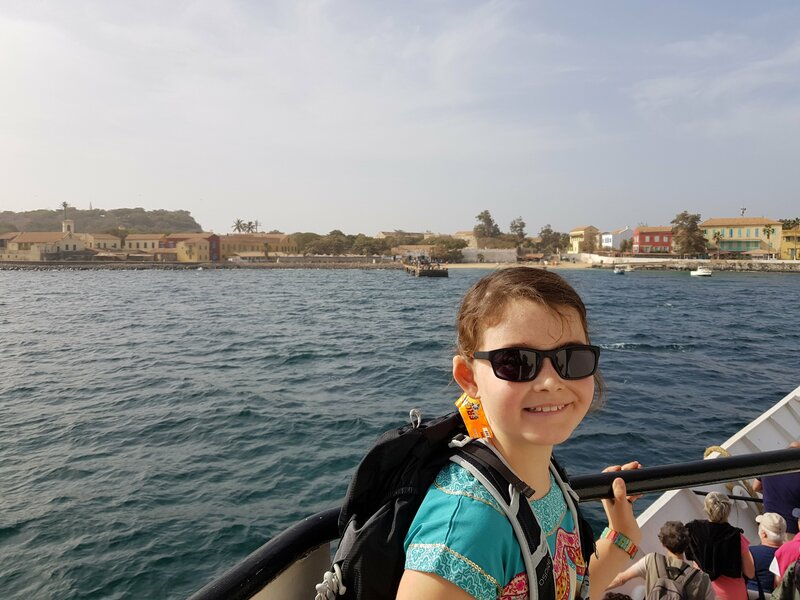 This morning when we arrived for breakfast, there was a little pile of things left for her from the other passengers – a bar of chocolate, a little bag, a necklace from Dakar, a card game. Somehow the fact that people couldn’t go shopping and had rummaged around for something special made it even more meaningful. I had decorated our table with confetti, and Lauren enjoyed taking the pancakes round (I’d made nearly 20 big ones). After breakfast, we had decided to ‘do’ presents the German way, blindfolding her and hiding them one at a time under a bin. She was then given a stick (a broom handle) and told to bash around until she hit the bin, with the adults calling out ‘hot’ ‘cold’ ‘chaud’ ‘froid’ – sometimes in a not very coherent manner. At one point she wandered out into the corridor while I was hiding another present, and she narrowly missed bashing the captain, who looked rather bemused as he rapidly sidestepped her flailing broom handle. The presents were just little bits of things really, with an emphasis on consumable or tiny, but she seemed happy and the game made them last longer! At lunch, the Germans arrived with sparklers and presented her with a card with tokens on for a game of monopoly, a game of ping pong and a game of wizard – ‘whenever she likes’ – which was brave! Vincenzo, our steward, helped me bring in the two birthday cakes (! ), decorated with various candles and edible decorations I’d brought with me, and we managed to make them stretch to all 37 people on board – it was Lauren’s desire that no one be left out. I was really glad we had bought the supremely expensive but delicious cake in Dakar, as the one I had brought from the UK wouldn’t have gone far. We also managed a version of Happy Birthday in English, French, Italian, Portuguese and German between us. After lunch we all congregated as usual in the lounge for table football, and the French and Swiss ladies requested a ‘dance show’ from Lauren, having seen her dance at some point before. It was the second time they mentioned it, so I allowed her to oblige (I am always wary of inflicting such things on people, lets face it, other people’s kids can be excruciating to watch, but they seemed genuine, and its not like they had the option of the Bolshoi). She did a couple of ballet pieces and then slammed out a crazy routine to Waka Waka. At some point, Bernard the French guy asked her to teach him some moves, to great hilarity all round, especially when she started with a kick down into the splits!!! The things he did with his hips should never be repeated. Around 2pm we crossed the equator. I was keeping a close eye on the GPS on my phone, and we went up on deck at approximately the right time to look around – not really sure what we imagined – some kind of dotted red line across the sea? 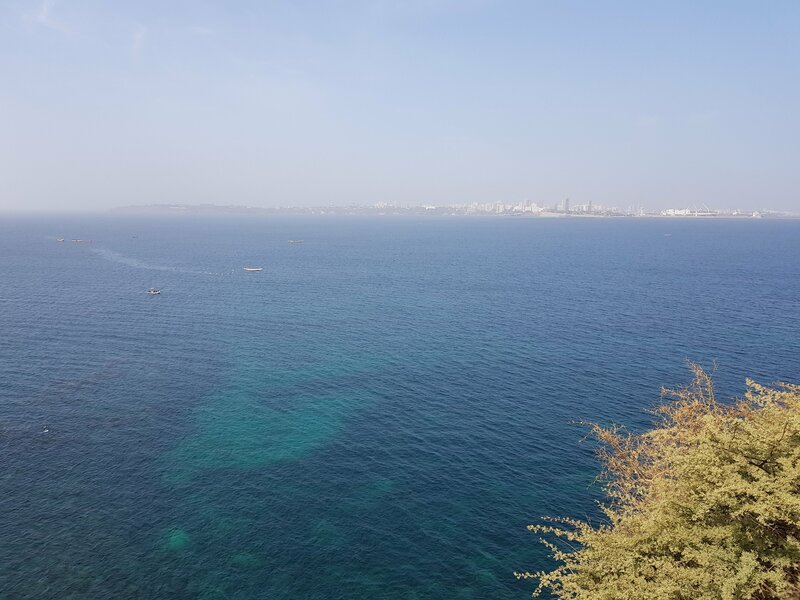 – but it was just endless sky and sea, as it has been since we left Dakar, and after taking a picture of the infinite stretch of nothing, we returned below decks to the cool of the cabin and (yet another) game of monopoly. Late afternoon there was a knock at the door. I wasn’t really decent so sent Lauren to answer it. She came back beaming with a bag full of stuff from the captain and officers: a Grimaldi cap and t-shirt, a game of scrabble (in Dutch, which adds to the challenge), and a bag with ‘Happy Birthday from all the staff of the Grande Amburgo” stuck on the front. I’d seen the captain rummaging around in the storeroom earlier, and assumed it had something to do with the mythical equator ceremony we had heard rumours about but that never materialized. Lauren was delighted, and wore the t-shirt and cap for the rest of the day. All in all, it was a wonderful, memorable birthday. In fact, it was so much easier than birthdays at home (involving parties, sleepovers, elaborate cakes and activities) that I may well plan to be in the middle of the ocean every 9th of January from now on ! The sun sets on a wonderful day…. Author choosingourownpathPosted on January 15, 2018 March 15, 2018 Categories Cargo Ship Travel, Travel, worldschoolingTags Travel on a Cargo Ship4 Comments on Day 23 – Lauren’s Birthday!!! Today I made some new piri piri. And boy did it not disappoint. In Dakar I had looked for chillies and only found some rather manky looking ones in the supermarket. I asked the guy selling vegetables and he said they were ‘a little spicy, not much’ and then when I asked if he had anything really hot, he said they were hot… so I got them, but didn’t have high hopes. I took a little off one and ate it, and it didn’t feel to have any heat at all, so I was massively disappointed and wasn’t going to bother. I then ate about a third of one. It turns out they are the hottest chillies I have ever tasted, but have a long burn, so that the little bite I took hadn’t kicked in until I took the second, and oh my goodness, I couldn’t talk! Lauren ran to get water and yoghurt, and then tissues for my streaming eyes and nose, but for the whole of today my mouth and throat have felt burned. So anyway, I wanted hot. Just have to be a bit careful. I chopped and sliced and squeezed, and watered them down with some red chillies, and presented it for dinner. I still couldn’t taste much, and warned the Germans to go easy. Exactly the same thing happened – the German guy took some, said ‘oh its not so bad’ and I felt a bit silly. Then about two minutes later he was gasping for water and bread. I am writing this a good few hours after making the stuff. My fingers have all swollen up, and feel like they are burning. I am sat with a wet towel, constantly stopping to cover one hand or the other. I’d love to know what that guy in the shop felt was truly hot, if these were ‘a little spicy’!!!!!! 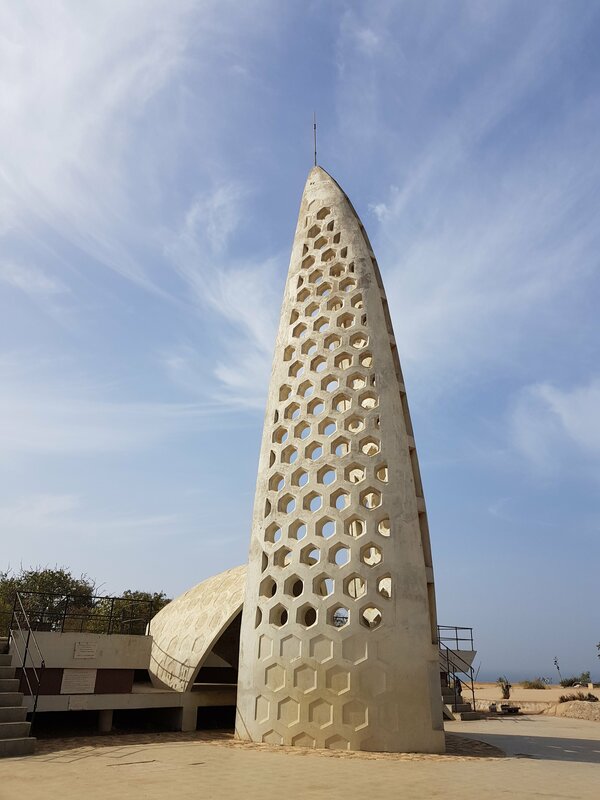 Day 20: 6th January – Finally….Dakar! We arrived late last night in Dakar, edging past Ile de Gorée, an old slave station just offshore, and docking as darkness fell. 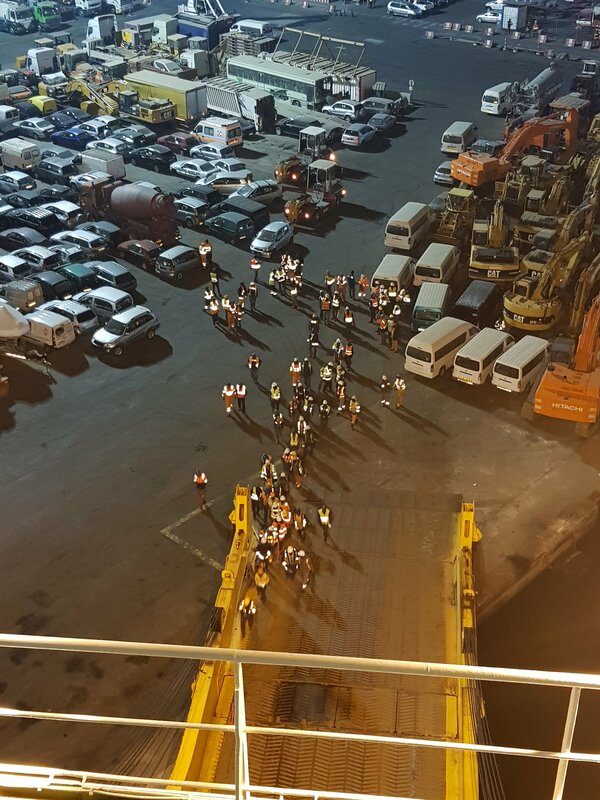 Dozens of port workers gathered on the dock and swarmed on board as soon as the ramp was down. I guess we are on the clock. We were told this morning that we could go ashore until midnight, which was a relief as I didn’t fancy our chances of a quick dash into town. 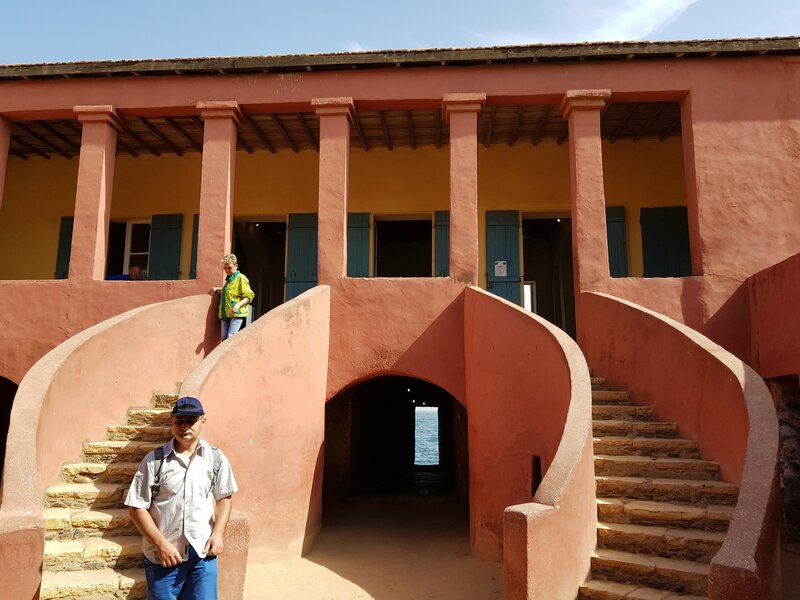 Given we had so much time, I decided to take Lauren to visit Gorée, and we invited the Germans to join us as well. Getting in and out of the port was a little confusing but of course confusion is our natural environment and all was well. It was good to be back on the continent. All day we experienced nothing but kindness and interest. A wholly positive day. Everyone talked to Lauren. 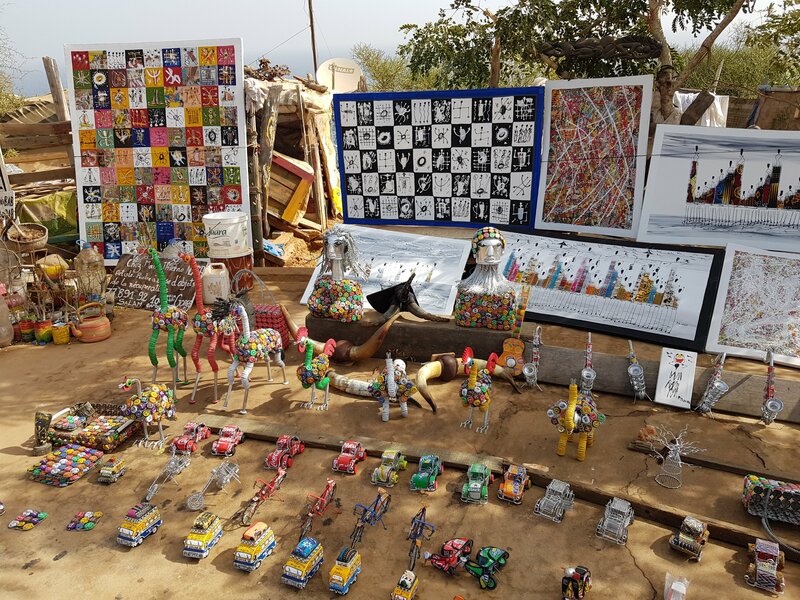 OK we got some soft-sell from the “official guides” and art/tourist tat sellers on Gorée but nothing like what I remember from when I was here before. 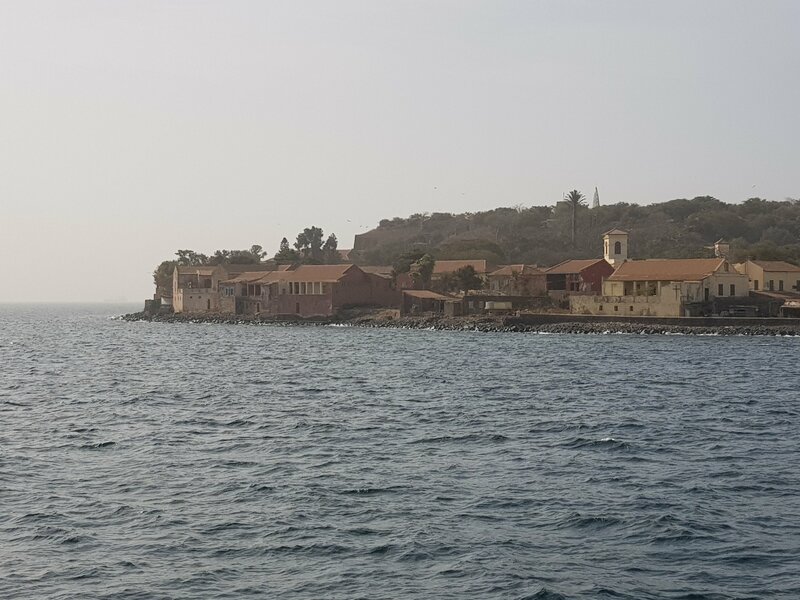 Once we emerged from the port we walked along potholed roads to the ferry to Gorée. They wouldn’t let the Germans in as they didn’t have their ID with them so while they trekked back to get their ID we went for a coffee and went to buy credit for the phone. None of the guys at the shacks we found had cards to sell credit, but one of them kindly took my phone and sent me credit from his phone then bought internet with it on my phone. In the meantime of course we had to have a looooong conversation about our lives, our journey and the future of Senegal….. All the guys standing around nattering joined in and we provided the Saturday morning entertainment. Eventually we made out way back to the ferry terminal and were soon joined by the Germans. We boarded the ferry (named Beer) for the 20 minute hop across to Gorée, passing the majestic looking Grande Amburgo who towered above us. That big G on the top, visible from miles away, is beginning to feel like home. We wandered up the cobbled streets to the memorial on top of the hill, dodging guys selling beads and paintings. We also investigated a massive cannon we found on the top of the hill. No explanations…. 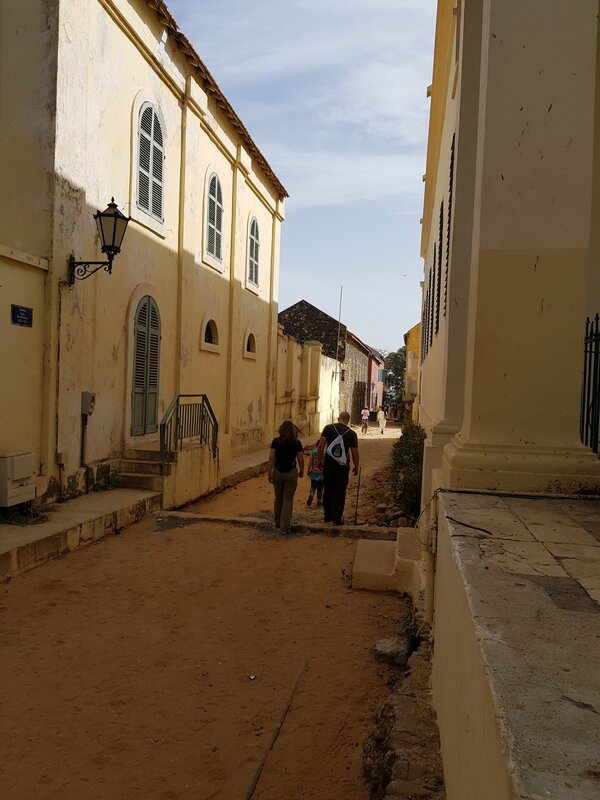 We then wandered back down to the Maison des Esclaves or slave house. This is one of the old slave houses that has been maintained as a museum. It’s a grim place but does really bring home the reality of slavery back then – the spacious and airy living quarters of the family above, the small and dank separate dungeons for men, women, young girls and children below. These dungeons included low-ceilinged ones too small to lie down in for punishment and a door of no return that leads directly out to the sea or of course in those days to an awaiting slave boat that would pack as many as possible in and take 12 weeks to make the crossing to the Americas. 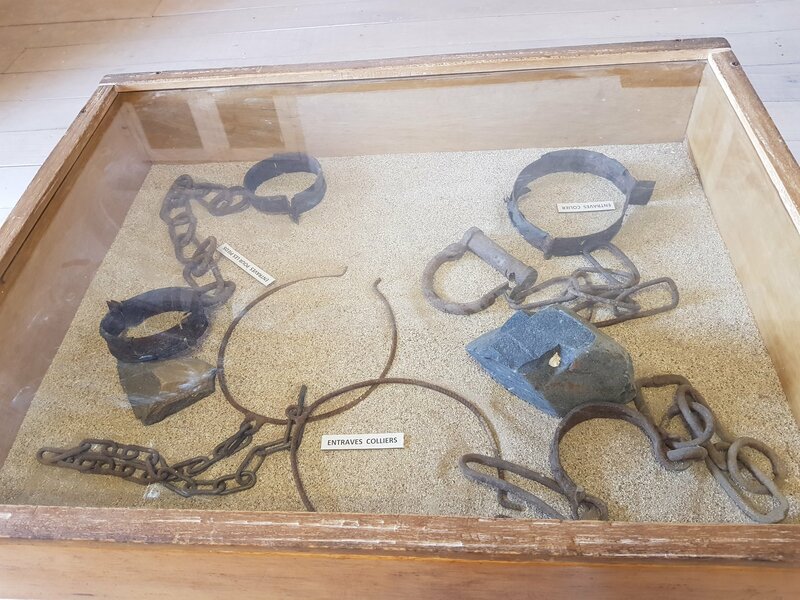 It was a sobering visit but I don’t believe in shying away from difficult issues and Lauren will be doing a “school” project on slavery in the next few days as well as reading 12 Years a Slave with me. 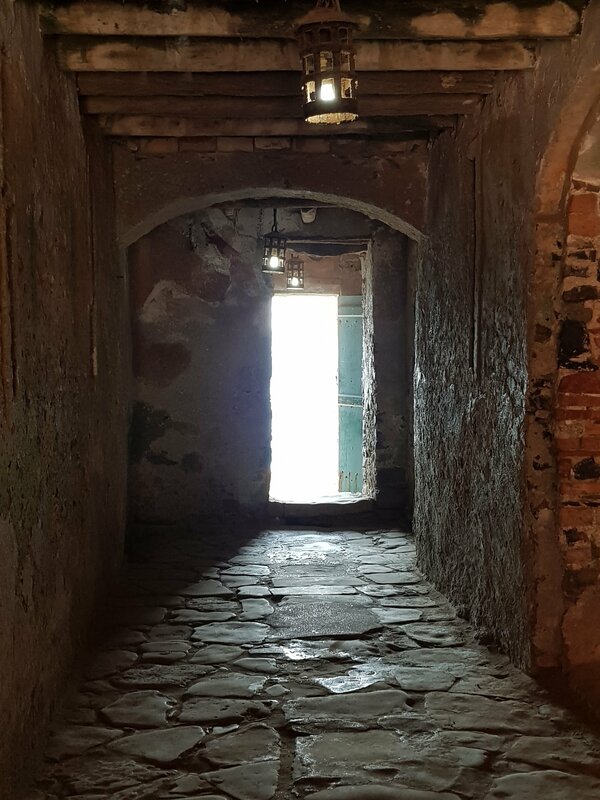 The door of no return. I think what stuck us all more than anything was the juxtaposition of a beautiful airy and spacious family villa above and the grim rooms below. It seems to show a complete lack of awareness of the evil of slavery and complete acceptance that slaves were not human. If slavers had felt guilt or shame at all about their activities they would hardly have lived above them with their families! 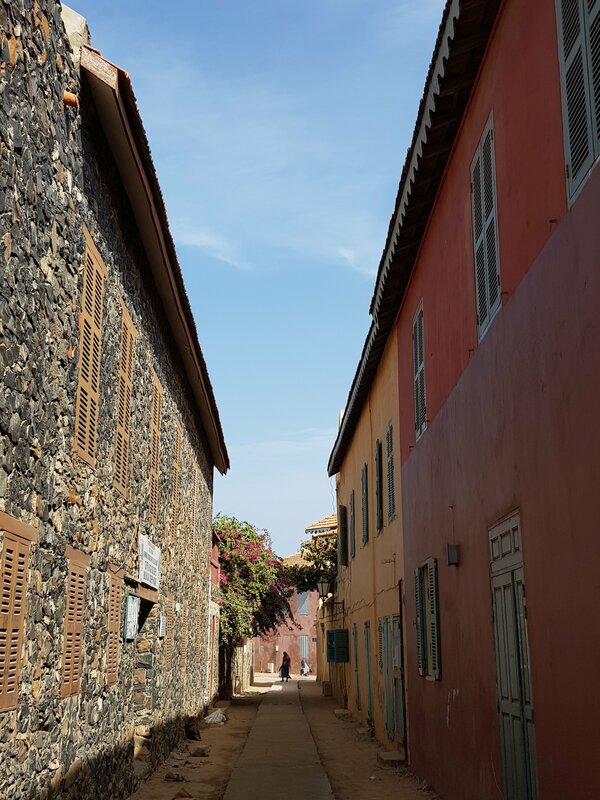 Despite the grim history, Gorée is beautiful and we enjoyed strolling around the quiet streets before returning to the dusty chaos in town. By 1pm we were all starving, having got used to eating our main daily meal at 11am, so we jumped back on Beer and made our way through the centre to a restaurant highly recommended for Senegalese cuisine. We had 3 different chicken dishes between the 4 of us and it was wonderful to eat some tasty, flavourful food. After that, we had shopping to do. Top of our list was a birthday cake for Lauren. Those of you who have been paying attention will know I secretly brought one and have secreted it away in a corner of the cold room. But I have no idea how good it’ll be after 2 and a half weeks and Lauren wanted one big enough to share with all the crew so I agreed we’d get one in Dakar. I think we found the fanciest patisserie in all of Senegal, with prices to match. 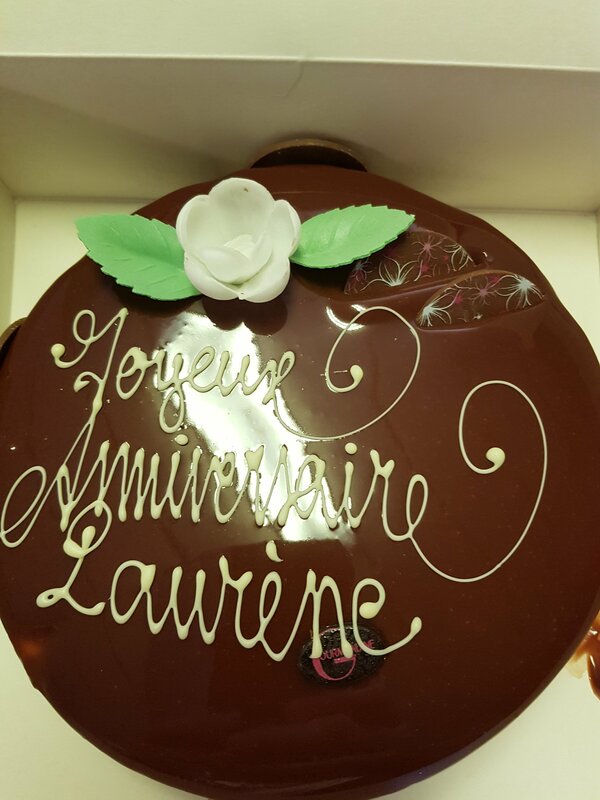 They didn’t listen when we told them how to spell Lauren but I quite like the French way…. she chose it herself and is delighted with it. I’m just grateful to have made it all the way back to the ship and through the chaos of the port with it intact. 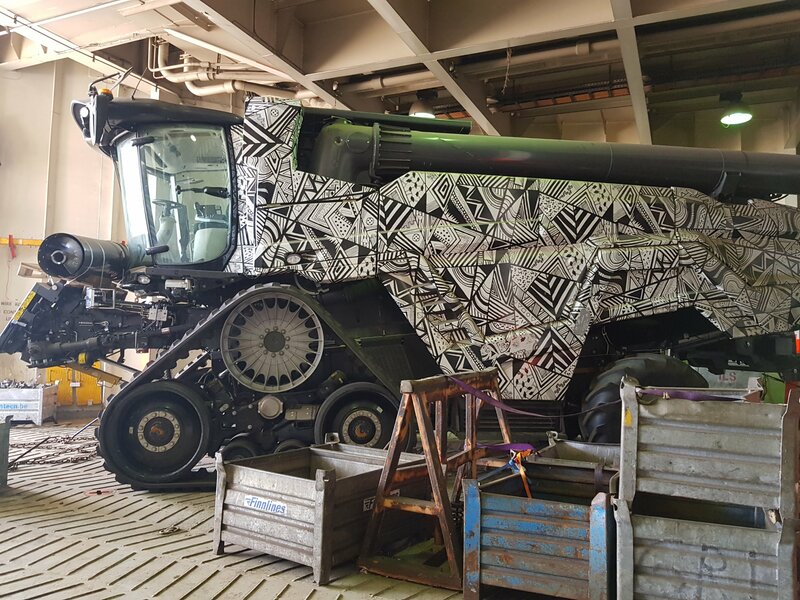 Look what was loaded while we were away….. not sure what it is but it’s cool. Ok, it’s over and out from us for a while as we stop hugging the coast and strike out South West across the equator towards our next stop, Vitoria in Brazil. I hope everyone had a good start to the year. 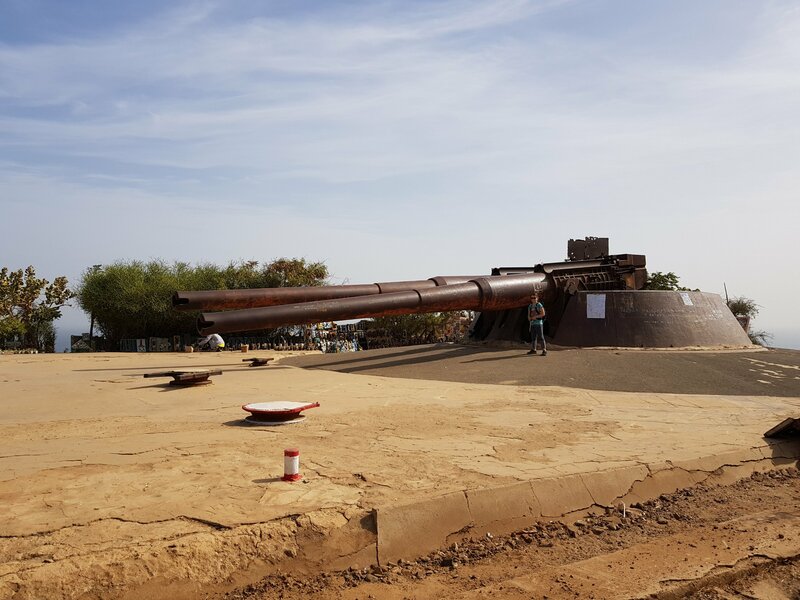 Author choosingourownpathPosted on January 13, 2018 March 15, 2018 Categories Cargo Ship Travel, Travel, worldschoolingTags Senegal, Travel on a Cargo ShipLeave a comment on Day 20: 6th January – Finally….Dakar! 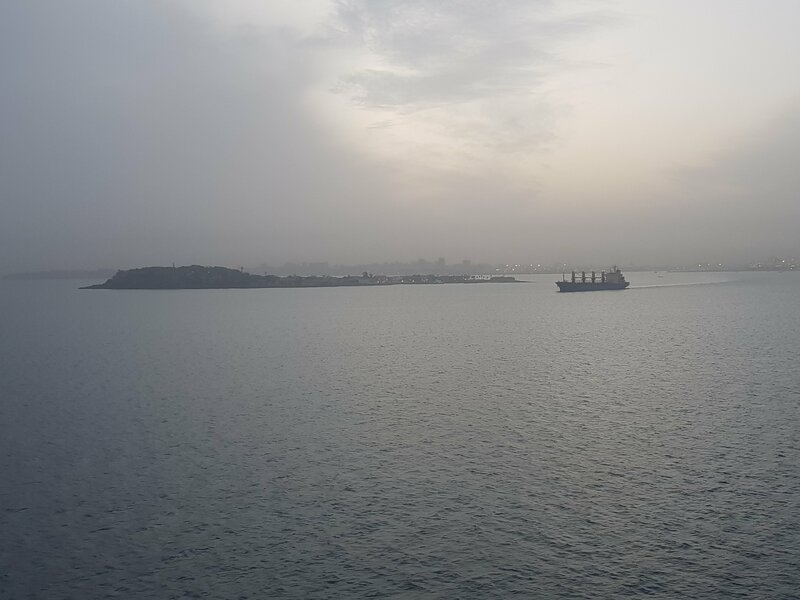 We passed the first 5 days of the year at anchor off Dakar, amid a haze so thick we never knew which way we were pointing or which way was land. Occasionally fishermen would pass by close enough to wave, and some of our lunches were supplemented by their catch. I also managed to get a sim card off one, which worked occasionally. 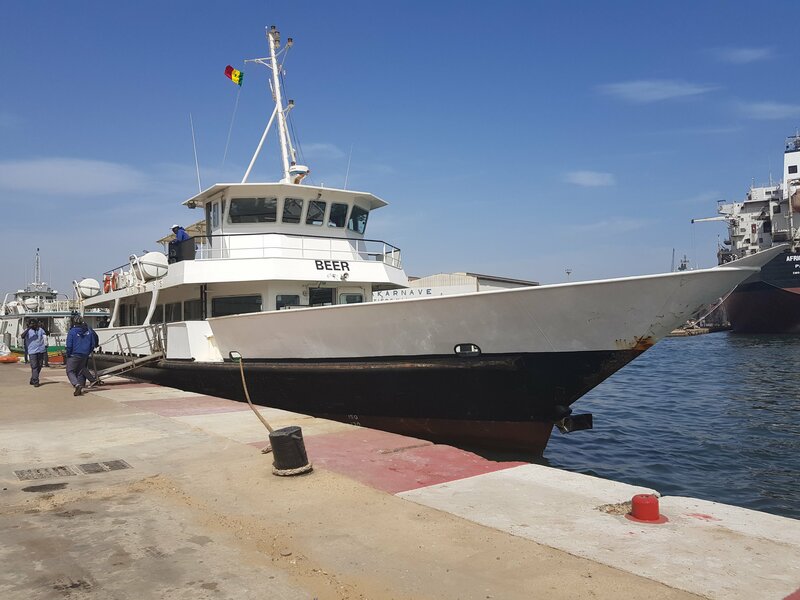 Today we finally got the news that we could dock this evening in Dakar. 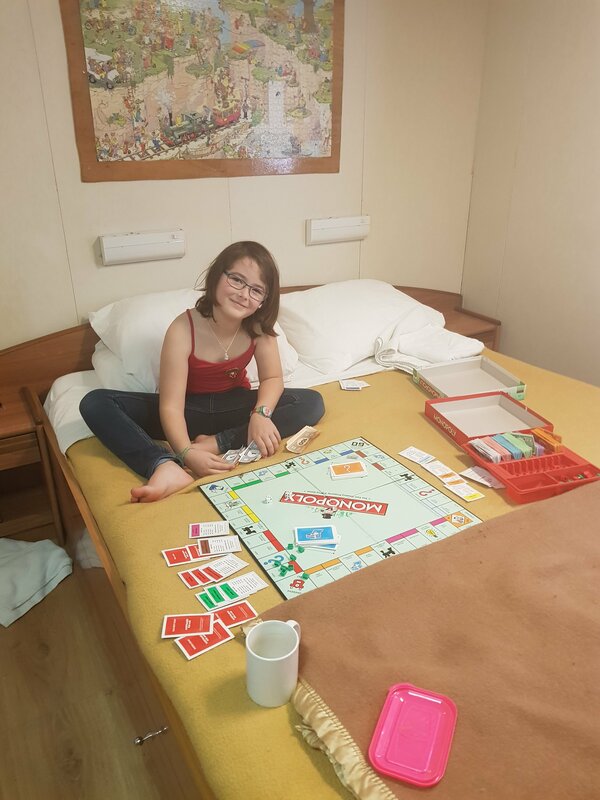 The days passed with endless games of monopoly – Lauren still hasn’t won but her desire to play is sadly undiminished – uno and a card game called wizard with complicated scoring that the Germans taught us. 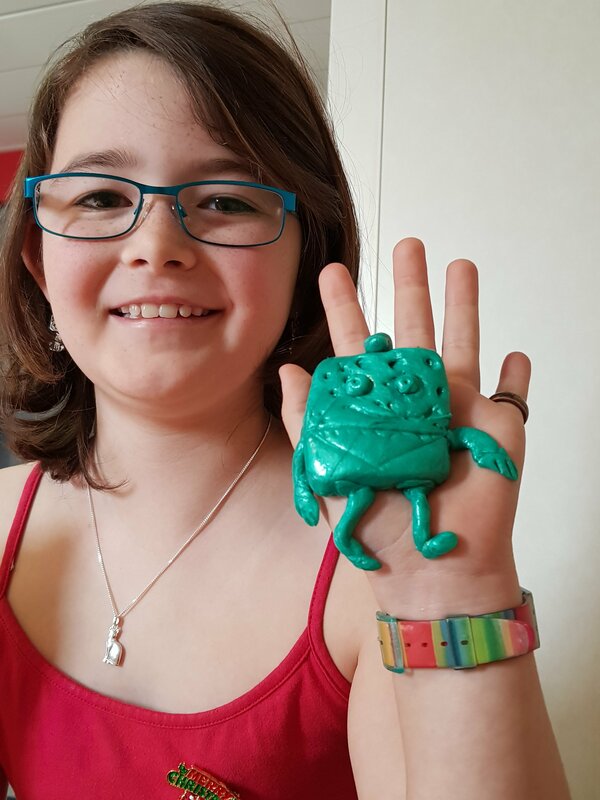 Lauren also spent an inordinate amount of time playing with goo. New Year’s Day was a fairly quiet one, for obvious reasons. No school, so we spent the day hanging out on deck and in the cabin, reading, watching a film (Beethoven, thanks Sive, she loved it), and playing Uno. The temperature is in the low 30s, and very dry. The haze is constant – a common feature of this part of the world, with dust driving down from the Sahara – to the point where the sun is partly blocked out. We can’t see the coast, and our ‘neighbours’ anchored around us emerge and disappear as the haze waxes and wanes. A number of birds have discovered us and perch up on deck, reluctant to move when we approach. The cricket is still on board, and Lauren visits it every day. As far as I can tell it didn’t eat any of the lettuce she got from the galley for it. I’m hoping I won’t be arranging a burial at sea for it soon – not sure what a healthy cricket looks like but it hasn’t moved in days. 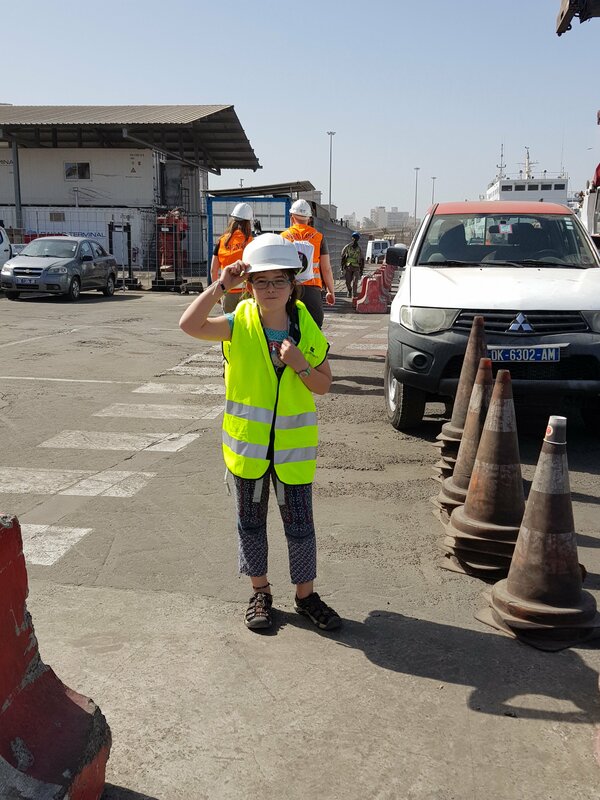 On the 2nd we ‘returned to school’ – always difficult after a break and we both struggled to focus, but we are making good progress and should have finished module 4 (of 8) before we disembark in Montevideo. Lauren is doing her French exam as I write this. I am taking my time with this module, and going over some of the concepts we may have skipped over quite fast in previous modules. After all, we have the time! But we are almost halfway the academic year and fully on schedule. Hopefully the next set of books will be waiting for us in Buenos Aires. I have no idea what the 5 day delay will do to our eventual arrival in Montevideo – the schedule is definitely padded and more of a notional outline than an actual plan. The captain told me that he can cut two days off our journey from Dakar to Brazil by speeding up, at the expense of more fuel. I’m not bothered in the slightest, after all it doesn’t cost more if we stay on longer, so its effectively free accommodation and board for any extra days, all of which helps the budget. But I guess the people waiting for their containers and brand-new cars might be a bit annoyed. I bet if one of the Mercedes’ on board were for someone important in Dakar, we’d have got into port right away! We can tell that the catering is suffering somewhat from the delay – one night we had a plate of plain boiled rice for starter, and there is no longer fresh salad. The only fruit now available are very old apples and oranges. We are all getting a bit sick of fish, slices of beef and pasta, and dinner conversations often revolve around what we’d like to be eating instead. We fantasize about chicken, fresh vegetables and anything spicy. To be fair, the food is well cooked and the chef does a good job with what he has on offer, but it’s all fairly bland and similar. 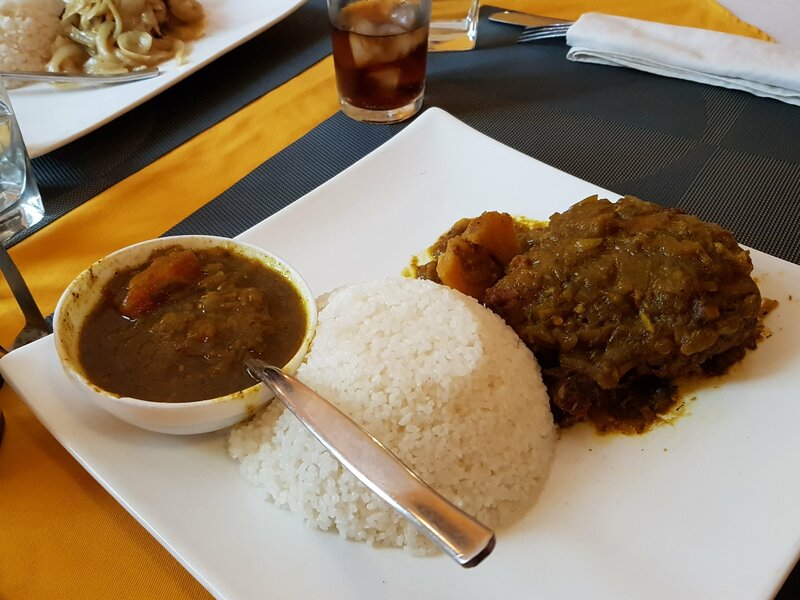 One night we got chicken curry and it was wonderful to have something with slightly stronger flavours. Unfortunately, the piri piri is finished (I emptied the last scrapings over my plain boiled rice starter). There is still plenty of wine though. The enforced quiet time has given us a bit more opportunity to chat to some of the officers on board. One of the few Filipino officers engaged me in a long conversation yesterday as I spent hours holding my phone aloft up by the bridge, at that time of day the best spot for a decent signal. The usual ‘are you a Christian?’ and ‘’where is your husband?’ quickly followed by ‘where is Lauren’s father?’ as well as a more philosophical discussion on the meaning of money and different mindset between us and Filipinos (acc. to him). I am looking forward to Dakar, and hoping we don’t cut time in port too short so we get at least half a day to stretch our legs.